Calim Grab Industry (Calim Kepce) Lifting Technologies manufactures of grabs and other lifting equipment which can be used to handle, among others, coal cargoes. The range of products includes bulk cargo handling as well as special hoists. Key areas of operation are ports, ships, manufacturers of cranes and construction machinery, steel mills, waste-to-energy plants and recycling/scrap handling industries. Calim’s main customers are: crane manufacturers; stevedoring companies; dredging companies; shipping companies; fertilizer companies; cement companies; mining companies; alumina producers; steel manufacturers; and electrical power plants. Calim Grabs has gained great expertise in handling all types of cargo, including: fertilizer; coal; gypsum; grain; soyabeans; sand; scrap steel; rock; clinger; cement; iron; ore; salt; petcoke; wood; chipboard and many more. Calim Grabs can be found everywhere where materials are handled, moved or positioned, and is a respected global brand for the loading and unloading of bulk carriers. The success story of the Calim Grabs began in 1970, with the building of the first grab — a mechanical 800-litre single-rope grab. Today, Calim Grabs offers a complete product range: mechanical two- and four-rope grabs, electro-hydraulic motor grabs, radio-controlled single-rope grabs, touch down single rope grabs, hydraulic grabs, as well as a wide range of special lifting accessories. Calim Grabs’ products are world-class, and the company proudly owns a modern machine park that is can adapt very fast to technological developments in the world. 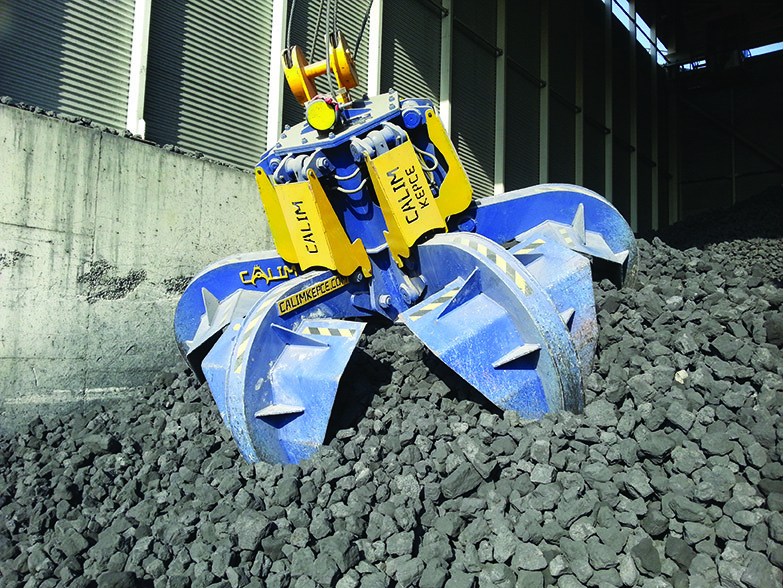 Calim Grabs specializes in the manufacture and repair of grabs which are used to handle a wide range of materials, including coal. Its well-trained and experienced staff work to develop highly efficient and cost-effective grabs. It offers great expertise in engineering and customer-focused developments. The company’s domestic and international market activity has been growing since the end of 2011. One source of satisfaction for Calim Grabs is the recent sale of 30 units to Latin America. Over the last few years, the products have been in operation in the largest ports in the world. Port activity is one of its key sectors and it is very conscious of the market’s new demands concerning product efficiency and evolution. Its last project was for a Algeria Annaba Port and AlcelorMittal steel mills. Calim’s products can be seen in many ports, cement and steel factories and on ships worldwide. They are especially popular in Latin America, North Africa, Venezuela, the UK, Romania, India, Pakistan, Singapore, Ireland, Bangladesh, Cyprus, Ghana, Madagascar, Ukraine, Sudan and more. The company also ships spare parts with any purchased product which may be needed in, say, six months, at no cost. The TR 1600 and TR 1100 are efficient tools for handling coal and other commodities including grains, fertilizers, other ores, clinker, bauxite and other bulk material. The TR 1600 has 3–50m³ capacity, it has two-line opening and two-line closing functions. The mechanical structure for opening and closing is efficient and original. No maintenance is required except greasing. The grab is easy to use and can work under any circumstances. The grab is mainly used on gantries, ships or port cranes to load and unload bulk cargo, including coal. v used to transport loads with densities of 0.5–3 tonne/m3 density; four-rope system; capacity of 3–50m3; painted twice to protect against corrosion. bucket jaws are made of special Hardox 500 steel material; cast steel pulleys are used. v TR1100 electro-hydraulic orange peel grabs for coal bulk. The number of tines varies between five and eight, according to the capacity of the grab, which varies from 0.5–25m³. It has a electro-hydraulic system that works with electricity. Its motor force is increased related to grab force. It is used by a control panel. The mechanical structure for opening and closing is succinct and original. No maintenance is required except greasing. It is easy to use and can work under any circumstances. Calim Grabs will continue to be a reliable name in the grab and lifting industry.